It’s never a good time for a dental emergency. There are ways to avoid injury to your teeth and gums during this time: avoid chewing ice, popcorn kernels and hard candy, all of which can crack a tooth; chew hard foods, such as nuts and peanut brittle, slowly; do not use your teeth to open or cut any type of hard shell; and avoid using your teeth as scissors on tape, packaging or ribbon. But accidents do happen, and being prepared for an emergency can mean the difference between saving a tooth and losing a tooth. Ask your dentist about after-hours emergency care. They will provide you with an alternate phone number or the location of an emergency dental clinic in your area. Post this information on your refrigerator or by your phone. 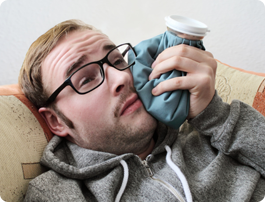 Here are some tips on handling some common dental emergencies before you can get to a dentist. First, call your dentist. Explain your symptoms and ask to be seen as soon as possible. Then ease the pain. Take an over-the-counter pain medicine that works for you, but do not put the pills on your sore tooth. Hold an ice pack against your face at the spot of the sore tooth. If the knocked-out tooth is an adult (or permanent) tooth, your dentist may be able to put it back. You must act quickly. If the tooth is put back in place within an hour or two, it has a fair chance of taking root again. After two hours, the chances are poor. If the tooth looks clean, put it back in its place (its socket). If this is not possible, or if there’s a chance that the tooth might be swallowed, put it in a container of milk, if possible. Go to your dentist, or to the nearest dentist, right away. First, try using dental floss, very gently and carefully, to remove the object. Never poke between your teeth with a pin or similar sharp, pointy object; it can cut your gums or scratch the tooth surface. If you can’t get the object out, see a dentist.